Ezra Klein continues his Health Care Reform for Beginners series this week with Health Care Reform for Beginners: The Many Flavors of the Public Plan and Health Reform for Beginners: The Difference Between Socialized Medicine, Single-Payer Health Care, and What We’ll Be Getting. You’ll want to read them both, but here I want to focus on the pretty pictures. You’re reading that right. 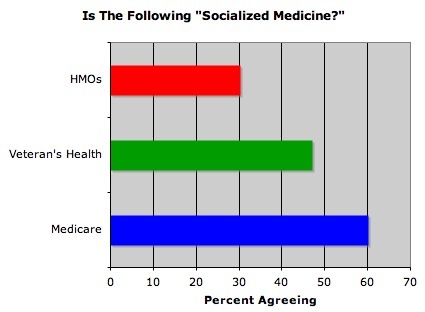 About 30 percent of Americans think HMOs are socialized medicine. Which implies a couple things. 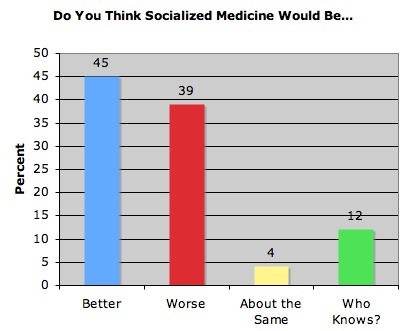 First, the term “socialized medicine” has been diluted beyond all meaning. Second, it’s no longer considered a terrifying outcome. And third, nothing that’s this amorphous — and actually preferred by a plurality of the population — is likely to prove a terribly effective attack against health reform. Socialized medicine has become such a stand-in for “not this system of medicine” that it’s begun to look good in comparison. Next Next post: Betelgeuse meets the kaplooey effect?